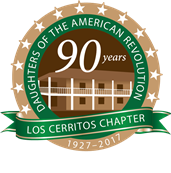 The Los Cerrito s Chapter, Daughters of the American Revolution, was organized on February 9, 1927. It was named after the historic Rancho Los Cerritos, one of two Spanish land grants on which the city of Long Beach was built. In Spanish Los Cerritos means "little hills" for all the little hills on which the city stands.